Special Offers from Discount School Supply®! : Introducing the Walkodile®! In many neighborhoods taking a group of little ones for a walk can be a very stressful experience. Navigating busy streets with children in tow can be a tense proposition. But not with the Walkodile®! 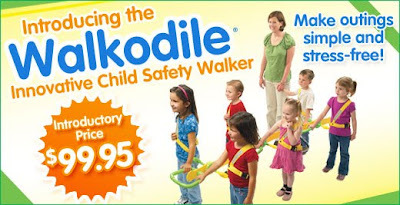 If you are looking for a safer way to walk outside with your group of little le arners then get ready for stress-free outings with the Walkodile®! This award-winning, revolutionary product, (developed by a teacher!) is available exclusively from Discount School Supply at the unbelieveable introductory price of $99.95! Safety and fun for under $100? What a deal! The Walkodile® makes walking outside with young children a happier and safer experience and encourages teamwork. Here's how it works: the flexible plastic Walkodile® spine has large handles for up to 6 children to hold. Each child wears a high-visibility adjustable harness that is connected to the flexible plastic spine of the Walkodile®. The unique two-way harness clip keeps children securely attached to the Walkodile® spine to prevent children from straying from the group or into traffic. The advanced design of the clip means only adults will be able to unhook the children from the harness. The Walkodile® spine measures 6'4"L and is adjustable for 4-6 children. The Walkodile® set includes plastic Walkodile® spine, 6 harnesses with clips, storage bag, and an instruction guide. It's the perfect way to walk outdoors with your group of little ones ages 3 to 7. Teachers and caregivers, visit Discount School Supply right now to get your Walkodile®. This amazing introductory price will not last for long. Now is your chance to get a great deal on a product that will make your outings less stressful and more fun! And don't forget that Discount School Supply is the best place to shop for great deals on top quality early childhood Furniture; Manipulatives; Arts and Crafts; Active and Dramatic Play materials and much, much more! Click here to take advantage of this special Walkodile® offer and be sure to visit Discount School Supply for all your early childhood education needs. Red, White and Blue Savings!